Bespoke academic publishing is at the heart of our business. Over time, this industry experience led us to blend, adapt and enhance outlines to create a selection of beautifully crafted textbooks for our catalogue. All of our textbooks have a uniquely South African flavour, and are comprehensive in terms of learning design. They include meaningful learning activities and proposed solutions. Full textbook outlines are available on request. ELE is a leading educational platform that delivers a multimedia-enriched digital learning experience. Its built-in functionality allows for the inclusion of online multimedia, such as text, exercises, assessments, videos, quizzes, eLearning interactions, open education resources, links to libraries and more. The additional highlighting, annotation and summary tools allow learners to engage with the multimedia, while the communication tools allow them to engage with each other, as well as with their educators – all in a single environment. From academic learning to workplace training, ELE will deliver. Need to support your learners in a distance or blended learning environment? Need an exciting and unconventional way to boost engagement in your classroom or lecture hall? We can provide you with access to our extensive video library, which hosts over 1 000 concept and software videos. A concept video refers to a bite-sized unit of knowledge on a particular topic. 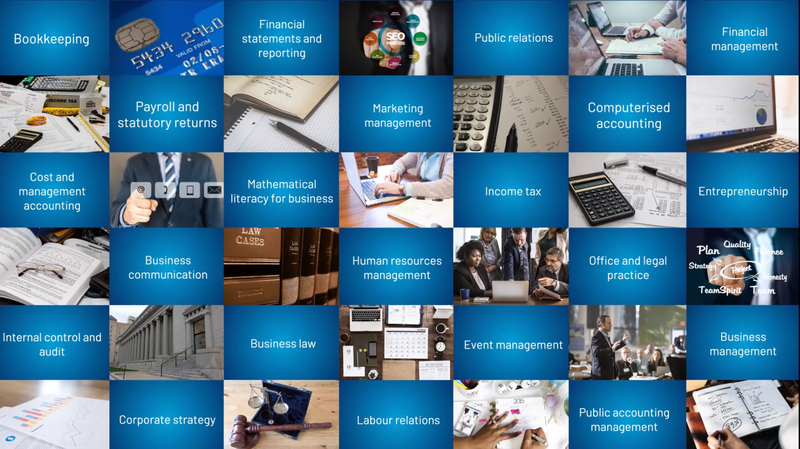 These videos cover subject matter in business, management and accounting disciplines at NQF Levels 4-6, and can be shared with learners in almost every teaching and learning environment. What makes our concept videos unique, is that they focus on specifically South African content, and are also narrated by South Africans.